Our story happens in the United States of America. Maveli has lost hope on Kerala owing to his bad experiences with mosquitoes, strikes, transport bus, ration shops, monsoon, pollution and thattu kadaas (road-side eateries) in god’s own country. Armed with a special invitation from Bush (not WMD), Maveli decided to visit US this Onam to see the welfare of Keralites in US. Maveli took the Air India (being ex-government, he insists on using government services) non-stop flight from Mumbai to New York. He wondered why the lemonade served on the flight tasted so horrible, not knowing that it was beer. Maveli asked the stewardess for a massage and could not understand why she refused, as devadasis (he was an asura king, remember?) in his Patal Force One flight used to give him a nice Ayurvedic massage. At the New York airport, Maveli asked the blonde behind the information desk, “Can you tell me the time difference between India and US?” She replied, “One second.” Maveli replied, “Ok, thank you” and rushed to collect his luggage. Though Maveli did not know English, he carried an electronic translator that his friend James Bond had gifted him. Maveli had attempted TOEFL after reading the book ‘Spoken English in 32 days’ that he bought from Kottayam bus stand, but failed miserably. Maveli was amazed at the two shiny silver walls that moved apart and back together again by themselves. He saw an old woman walking up to them, pressing a button, the walls opening and the lady entering a small room. The walls closed and Maveli saw small circles lit up above the walls. The walls opened up again and, lo behold, a beautiful twenty-something-old woman stepped out. Maveli noted in his mental diary to remember to bring his wife the next time he visited US. But Maveli found it strange that people were kissing in the public, which was a very private affair in Patala. He even found that the reaction of the women were different. While all women in US were responding “kiss me gently”, “kiss me softly”, “kiss me like there’s no tomorrow”, the reaction he got while kissing in Patala were “don’t tell anybody” or “don’t tell my husband”. Maveli went to visit the Statue of Liberty since he had heard a lot about it. As he stood admiring the crown on the statue, a Mexican told him that it is for sale for $1000. When Maveli gave him the money, the Mexican said he will get a ladder to remove the crown and never returned. When Maveli passed by in the evening he again couldn’t help admiring the crown. The same Mexican came and told that it is still available for sale for $1000. Maveli becoming wise this time gave him the $1000 and asked the Mexican to wait and said he will get the ladder this time. Maveli subsequently went to Charlotte as he knew that Salil’s cousin lived there. Since he reached late in the evening, he visited a bar. The man on his right ordered, “Johny Walker, single”. The man on his left ordered, “Peter Scotch, single”. So Maveli ordered, “King Mahabali, married'. Maveli then flew to Fremont to visit Salil. But unfortunately, Salil was on his usual cross-country IR trips. So Maveli left a voice message and returned to Patala. After returning to Patala, it is reported that Maveli has started using nope (for ‘no’) and yep (for ‘yes’) to answer questions. He has started saying hey (instead of ‘hello’) and eating candies (instead of ‘chocolates’), cookies (instead of ‘biscuits’) and yogurt (instead of ‘curd’). He has switched to diet coke (instead of ‘buttermilk’) and pizza (instead of ‘dosa’) for dinner. He has started taking cabs (instead of ‘taxi’) to go on the freeway (instead of ‘highway’) even if he has got to go (instead of ‘have to go’) to a place less than a mile (instead of ‘kilometer’). And it seems these days when Maveli listens to music, he says ‘yo man’ often. God save US.. sorry Maveli! Thank you for the wishes. And that was a good comment early morning. This post was on a very lighter vein anyway. Thank you for Onam wishes. I guess that is what I have done in all my posts - find a theme, bring in a personal touch, add some popular jokes and thread them all together. That is one of the most hilarious pieces I have ever read. Man of man, I think you should seriously think of taking up script writing for movies, you can earn some big money there.I will recommend you to Priyadarshan uncle or Yash Chopra uncle.Do let me know. Shappy Ponam ..ohhhh sorry Happy Onam.. Happy Onam to you too. I am an accountant and married; so you see where the humour is coming from. Thank you. They will keep flowing as long I keep travelling. Thank you; but what more to expect from my brother than kind words! I hope you know that I did script write a couple of comedy plays - one in my company last year. Lol..That was a great post..I guess Innocent and others ahve polularized maveli,that we see him as a cool man ..
Patal force one :-) is it superior to air force one? fantastic... I am in awe of ur talent!! amazing write up.. Looking forward to more reads!! that was so cool...just hope some right wing hindus dont get after ur life ....post this post. but then am sure Maveli will help u and ask his friend Bush to hide u in afghanistan. Yes, Mimicry artists gave Innocent's sound to Maveli, which I guess have now got stuck with portrayal of Maveli. How can Air Force One made by mortals be more superior to Patal Force One made by the evil forces of the dark? Even Darth Vader aspires to have a PFO! Right wing hindu activists of Kerala will have to take a lot of lives before they get to me in US, if they want to eliminate all folks who uses a bit of not-so-damaging Maveli funs. a lot of such never- been- to -US-but-behave-like-american,yuppies here in bangalore. I hope Maveli actually reads this. So that he will never plan a visit to US, if at all he ever plans to do so. Actually, it doesn’t matter how you came here, as long as you keep coming here. Get the picture? Oh you bet Bangalore is full of them. At this rate, after a few more years, Bangaloreans will start to show the ‘perceived’ American way of life MORE than the actual Americans. That is the time when being seen as non-American will be ‘cool’! Thanks a lot for the lovely wishes in my blog. 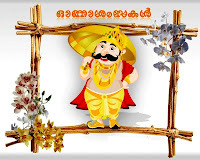 Wish you and your family belated Onam. I enjoyed your post very much (and the one before it). Will have to stop in more often to see how you are doing. Since I was away from my family, it was kind of a not-so-merry Onam this time around. That can be turned into a little stage performance. Nice write. I personally think everything in India is now commercialized and hence lost the charm. But I guess my parents also would have felt the same way about things when they were younger. I will visit your post soon. Thank you. You ran all the way to this blog, wow! While dreaming, there should not be any limitations. Why a play, I am thinking about a Hollywood blockbuster. I am on the lookout for a producer with money and no brains (remember, he has to agree to produce this). Will ensure that Maveli stays back next Onam. Perhaps he's had a lift aka elevator installed in Patala? "not to Sidhu; that is his friend in Patiala" - lol! how come maveli has friends in punjab? British English is fast fading from India, atleast definitely from Bangalore. Of course, Onam wishes accepted. And belated wishes to you too. Don’t bother, I am sure Maveli will NEVER EVER come this way again! I think he is in for a big disappointment if he installs a lift kiu (known in US) elevator in Patal. But to answer your question, Maveli is a well-travelled man, you see. Thank you Salil for the wishes! India seems the new 'melting pot' It has its good and bad, but hope things don't evaporate finally!